Quick, which one of these is better for your company? If you answered b, you are correct. Once a customer is satisfied with your company, they are more likely to be a customer for life. According to the US Small Business Administration, 68% of customers stop doing business with a company because they are upset with the treatment they’ve received, and 14% leave because they are dissatisfied with the product or service. This shows that it is important to conduct satisfaction surveys to find out whether your customers are satisfied with your product or service. Satisfaction surveys are mostly conducted by phone or by mail-in questionnaires. 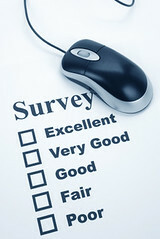 They often consist of multiple questions, which customers must rate. For example, a typical question on a satisfaction survey would be: On a scale on 1 to 5, how satisfied are you with our product? These type of questions are great for gathering satisfaction scores. Knowing that customers rate a product 4 out of 5 surely makes companies feel good. However, it does not tell them why it was only rated 4, and what they can do to achieve a perfect rating. Think about how frustrating this must be for customers. While satisfaction surveys allow companies to let customers give their opinion about their product, they are not improving the customer experience as the satisfaction scores won’t lead to any solutions. With OneDesk, companies can ask their customers to vote on feedback, submit suggestions about their product and collaborate with customers to find out what would really satisfy them. More information on gathering feedback through OneDesk can be found here.